Teams taking on Leinster require centres who are highly skilled passers and able to control their running speed and depth, because the Irish province’s outside backs ﬂy out of the line to try to create havoc in the passing channels. The international calibre of their back row means they’re equipped technically and physically to counter-ruck and jackal for turnovers. Their centres are emulating the tenacious prowess of their famous predecessors, Brian O’Driscoll and Gordon D’Arcy. But it’s the signiﬁcance of the leader of their defensive line speed that is drawing most attention. Leinster’s aim is to put the opposition’s ﬁ rst receiver under huge pressure. A designated defender, usually third man out from the ruck, rushes out to try to hurry this key ball-player into making mistakes. Leinster are conceding less than two tries a match and are mounting a strong challenge in the Pro14 and in Europe. This is largely down to a well-organised and totally committed defensive effort. The key to good defence at the tackle is winning the race to get there and the height battle. Leinster like to ‘bodyguard’ the tackler so they’re already in the vicinity of the ruck. The ‘plus-one’ player (next man in after the tackle) aims to get underneath the ﬁrst clear-out man and onto the ball. They sometimes double up, with the tackler getting to his feet and binding onto the ﬁ rst man to make them an immovable object. 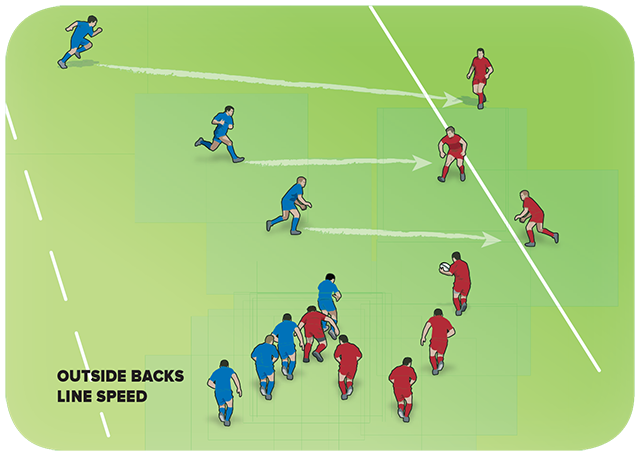 If they can’t win the ball they will attempt to drive past it, slowing possession for the opposition scrum-half. 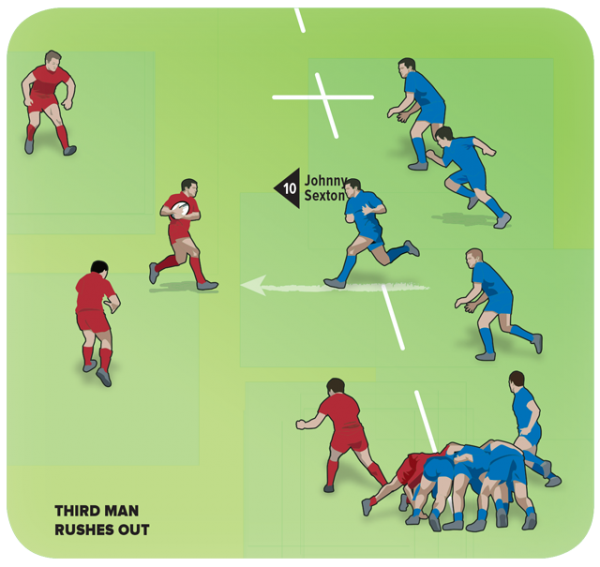 The role of the third man out in Leinster’s defensive line is to rush the ﬁ rst receiver. This player, often Johnny Sexton, is usually ahead of anyone else in the line. His sole focus is that ﬁ rst ball-player, trying to get to him ‘man and ball’ or get into his eyeline to ‘spook’ him to run back inside towards the ruck. Leinster are the best exponents of this I’ve seen. 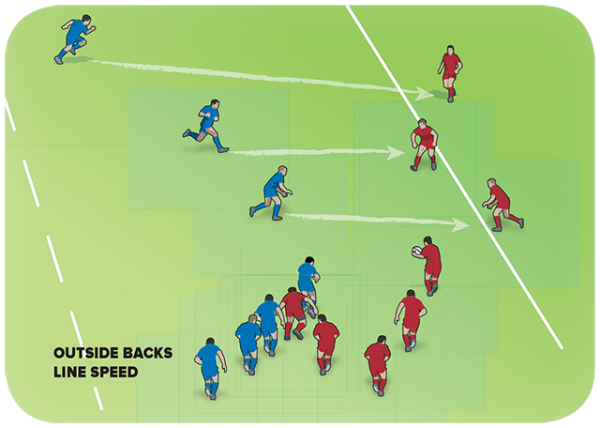 The most vulnerable areas to defend are the wide channels where outside backs are exposed to high pace. As the attack unfolds, they have the furthest to travel and at the highest speed. The secret is to identify which player is the target, working from out to in, and commit to rushing up to tackle or intercept. Leinster’s outside backs aren’t worried about leaving spare attackers on the outside if they can stop the attack getting there. How can I get my players to ‘win the race’? The entry to the ruck through the ‘gate’ and hindmost foot is strictly refereed nowadays and therefore makes this skill even more impressive. You can have great success by getting your tacklers to practise getting to their feet quickly, staying low and using their own body weight to ensure correct entry to rucks. And remember, these players have to ‘release’ tackled players or players on the ﬂoor and referees like to see a clear show of hands. Why not experiment with a heavy tackle bag and devise some post-tackle exercises? What are the potential pitfalls of the third defender rushing out? Defenders either side of this player – sometimes called a ‘rabbit’ – have to be on high alert. That’s because a natural dog-leg appears in the defensive line that the best teams might look to attack, with runners on the inside and outside shoulders of the ball-player. So this is basically a blitz defence? Yes it is. I coached the Ospreys with a blitz defence for many years and although it’s certainly a high-risk strategy, it also brings high rewards. Few teams are sufficiently skilled at high speed against a committed blitz defence to get around it. As an attack you therefore have to try to go through it, and if the defensive team is equipped with a physical, agile front ﬁve, strong-tackling three-quarters and hungry, over-the-ball back-rowers, you’re in for a long day!